Holley Carburetor - Keith Dorton Series UNIVERSAL - Pann Auto Performance - San Diego largest aftermarket automotive performance parts - What do you drive? The 0-80583-1 carburetor shares the hugely successful features of the original 4412 carburetor, but with changes aimed directly at circle track cars. The choke assembly has been removed for unobstructed airflow, utilizes the HP metering block , 30cc accelerator pump, welded throttle lever, screw in air bleeds and stainless throttle plates, plus it has been specially calibrated for circle track racing use. It comes out of the box ready to run with less modifying and less tuning at the track! 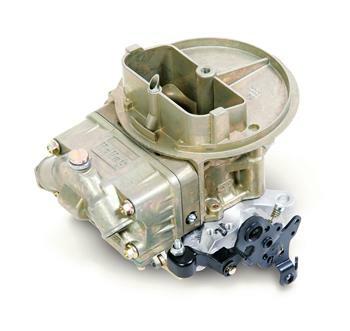 The 0-80787-1 carburetor shares the hugely successful features of the original 7448 carburetor, but with changes aimed directly at circle track cars. The choke assembly has been removed for unobstructed airflow, utilizes the HP metering block with changeable emulsion bleeds for infinite tuning, 30cc accelerator pump, welded throttle lever, screw in air bleeds and stainless throttle plates, plus it has been specially calibrated for circle track racing use. It comes out of the box ready to run with less modifying and less tuning at the track!